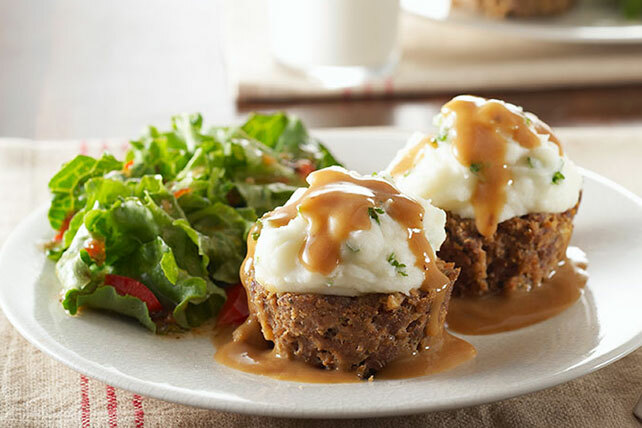 Try a savory dish that looks like a muffin with our Potato-Topped Muffin Tin Meatloaf. This muffin tin meatloaf may earn you the title of rock-star mom. Mix meat, stuffing mix, water and A.1. just until blended; press into 12 muffin pan cups sprayed with cooking spray. Bake 20 to 25 min. or until done (160°F). Add cream cheese and garlic to potatoes; stir until cream cheese is melted. Stir in parsley. Scoop over meatloaves. Serve topped with gravy.